Nessie is fast but our boats are faster. Hold on tight and keep your eyes open. The best family trip on the whole of Loch Ness! Nessie is fast but our boats are faster. 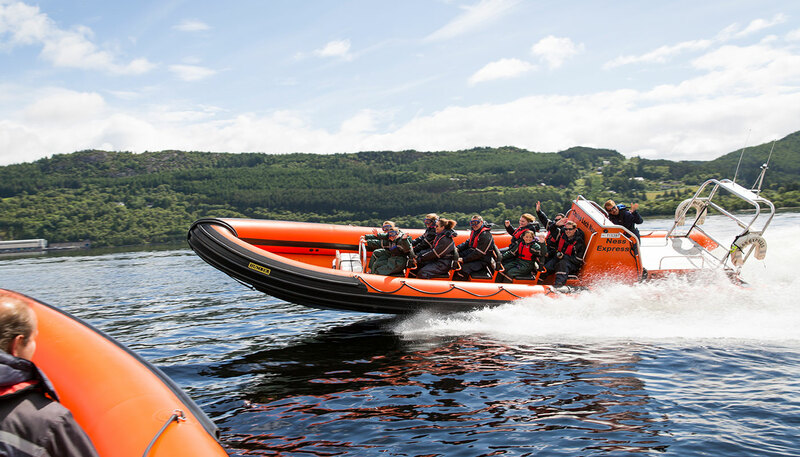 Kids (and big kids) will cheer and whoop as they’re zipped across the water in search of the secretive Loch Ness Monster. If anyone is going to track her down, it’s our guides so hold on tight and keep your eyes open. She’s there, somewhere. Our guides enchanting stories on our beautiful beast and the lesser known Kelpies will capture the kids’ imagination... and attention long enough for parents to take in the sites. RIB trips are not operating over the winter months due to low temperatues. RIB trips will resume on 6th of April 2019. Do all trips go to Urquhart Castle? Can I take a camera onto a RIB? You never know. You could be one of the lucky ones! We might know where she lurks. We might not tell. No, only the Urquhart castle Experience and Exhilarating Half Day Thrill Ride take you to the castle. We don’t care how you get here, just get here if you can. Easiest way to find us is with Google Maps. Of course! You need to be able to share your experiences at Loch Ness with the world. We’ve got a wide range of thrilling RIB tours, from 60 minute adventures to three hour bonanzas. Is 60 minutes enough? Wait, you’re meant to be asking the questions. No, it’s not is the answer. We wish. The RIBs are in the water from 24th March to 31st October although not all of our tours run during this time. Please check our tour timetables for more information as we wouldn’t want to disappoint. That depends how good you are! No. The boats don’t spray water into the boat. We also provide warm cosy suits for you to wear to protect you from the Scottish elements. If you’re joining us on a chilly day, we advise that you should bring a few warm layers for underneath the suit. Stay warm, have fun. Yes. The minimum age for our RIB tours is five years old. The good news is there is no upper age limit. We had a 90 year old once who whooped and hollered all the way around the loch. Unfortunately not. We've found our furry friends much prefer it on dry land.